There are many different ways to teach children, each situation is unique and every child learns in his/her own way. These downloads are things that we made for our children in the way that they learn best and we hope that you may find some of them useful in your own home. 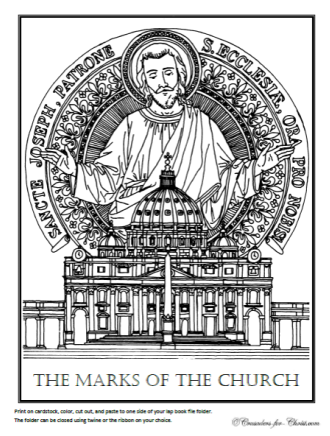 If you are looking for one of our many Catholic Handwriting pages they now have their own home over at our Catholic Handwriting Page found here. All of these files are copyrighted by Crusaders for Christ. This study guide was written, first of all, for Jesus in the Blessed Sacrament and secondly so that it will help His little lambs to know and love Him better through His gift of the Holy Mass. Please note: On page 86 one of the cut out items is miss-labeled. I have labeled the Amice twice. The long gown in the bottom right hand corner of the page should be the Alb not the Amice. I would like to share a Lapbook that I put together for my 9 year old as we work our way through Leading Events in the History of the Church. I'm not very good at putting together directions for these books like others who do them, so I will just share with you some pictures I took while making it. They have captions and hopefully give enough information on how we will put it together as we work through the history book. Please note: we put this lapbook together so we could share it. The details like the coloring need yet to be finished. You can find it on our blog. To print the report card, (card stock works great!) Print one side, reinsert the paper and print the second side. Fold down the center.